This delightful Victorian/Neo-Jacobean house was built in approximately 1874 by W. G. Scott of high quality imported brick and terra cotta, it is presently the home of the Knights of Columbus, who acquired it in 1921. 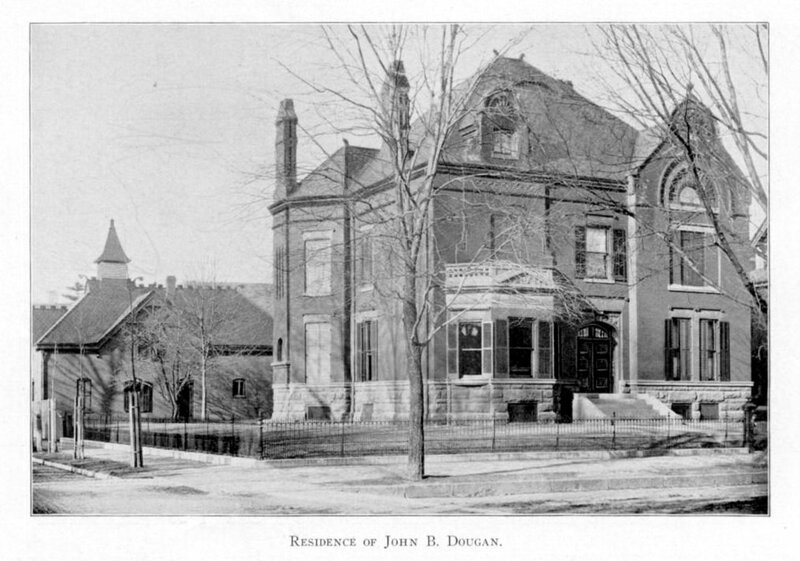 Research indicated that John B. Dougan purchased it from Mrs. W. G. Scott. There is some confusion as to the exact date this structure was built because of a prior structure known as 202, which, it is believed, was owned by W. G. Scott and was razed so that the present building could be erected at the same location. Speculation could also indicate that the original structure was partially razed and then an extensive renovation done. The barn to the rear of this structure is believed to also have been built prior to the Civic War at the same time as the original structure. William G. Scott was a cousin of Andrew F. Scott who resided just south of his home. Wm. G. Scott and Andrew F. Scott were presidents of the Second National Bank. John B. Dougan was its fourth president, serving from 1900 to 1914. Daniel G. Reid, who previously resided at 302 N. 10th, acquired the property from his half-brother, J. B. Doughan. Mr. Reid's daughter, Mrs. Henry (Rhea Reid) Topping sold the property to the Knights of Columbus in 1921. Mr. Reid's grandson, Daniel Reid Topping, was co-owner of the New York Yankees at that time. The barn to the rear of the structure was razed in 1962 so that the K. of C. could expand their clubhouse. The barn served as a bottling facility for the Nehi Bottling Company, and the garage space for the Palladium-Item. The Scotts and the Dougans used the brick barn to keep teams of horses which drew their carriages around town. Wm. G. Scott married Malinda Gaar, daughter of Jonas Gaar, and became a member of the Gaar Machine works, later re-named Gaar, Scott, and Co. This 12 room brick Neo-Jacobean house was built by Wm. 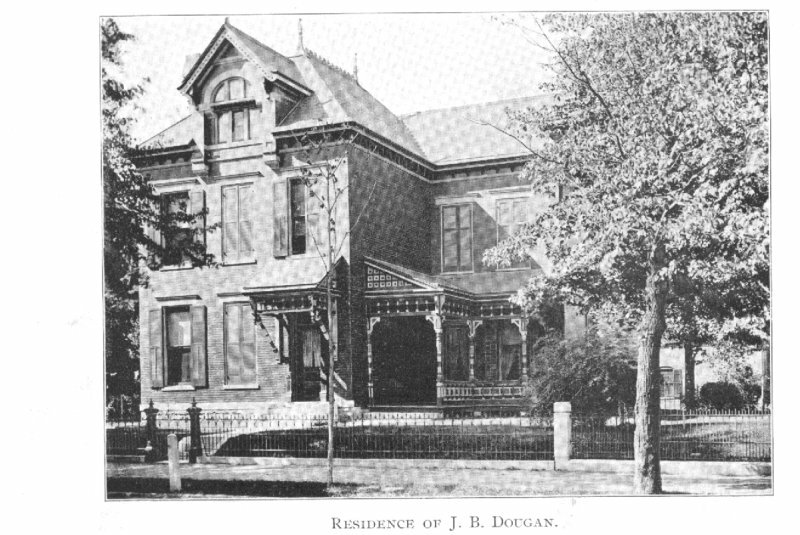 G. Scott, father of Mrs. John Dougan, for Mr. and Mrs. John Dougan was razed in 1959 for additional parking spaces for the Stegall-Berheide-Orr funeral home and the Knights of Columbus clubhouse. The structure was built, approximately, in the early 1890's. It is believed that an earlier structure existed on this location with an address of 206 and was razed so that this structure could be built. Some of the owners and residents of this house were Henry C. Starr, a Richmond attorney; Charles A. McGuire; and Addison H. Gist who purchased the property in 1923. Mr. Gist was a dentist and had real estate interests. Hinson's Health Institute was the last owner of this property. This exceptionally fine Italianate structure situated on lots 192-193 of the Charles W. Starr addition to the city of Richmond is believed to have been built by A. W. Mendenhall for John Milton Gaar (1823-1900) and sold to James E. Reeves. Mr. Reeves moved into the house on March 13th, 1863. He was the son of Mark Reeves and was born in New Jersey. After a varied career he and his brother became charter stockholder's of 1st National Bank and became its first president. He was also president of Champion Roller Milling C., aided in the organization of the Richmond City Mill works, and helped effect the purchase and building of the Morrisson-Reeves Library. Mr. Reeves was affiliated with Purdue University as Treasurer of the Agricultural College. 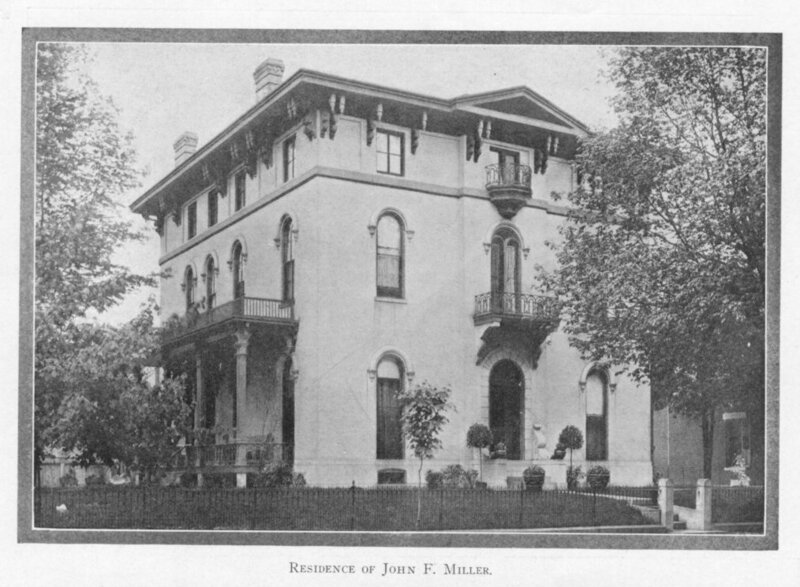 After his death, Mrs. Reeves sold the house in 1904, to John F. Miller and moved to 200 South 16th Street. Mr. J.F. Miller was associated with Pogue Miller & Co., a railroad magnate, and founder of Glen Miller Park. The Moose Lodge purchased the structure in 1916, used it as it's lodge and in 1927 sold the house to Stegall Bros. The original owner of the land was Jon Meek in 1805. Mr. Meek was the brother of Jeremiah, an early Wayne County Judge. The present structure at 232 was built on lot 194 after the demolition of the smaller structure shown below. Lot 194, known as 252 N. 10th Street, was sold by Arthur W. Mendenhall to John Milton Gaar, father of Mrs. Jos. 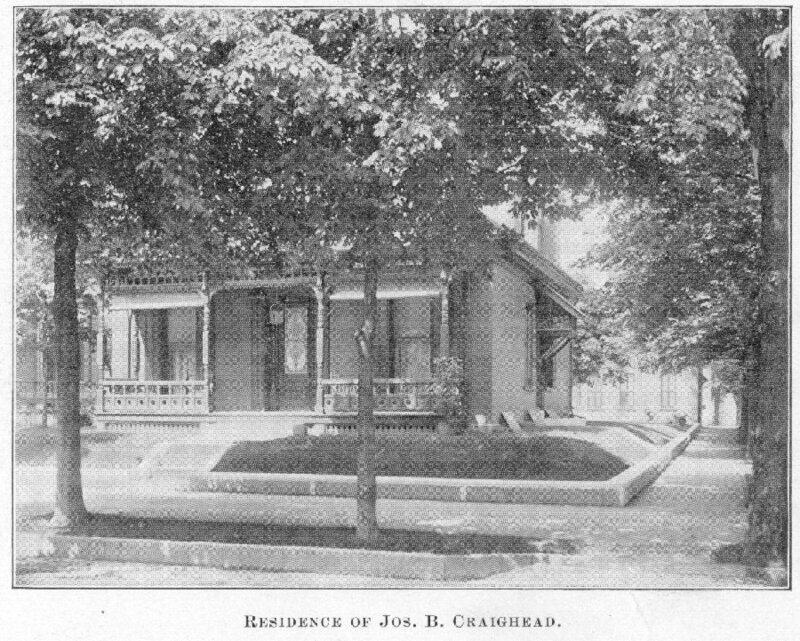 B. Craighead, in 1857 when it is believed the smaller structure was erected. The present large eclectic with classical architectural influences is believed to have been built in the 1890's by Joseph B. Craighead. Records indicate that the smaller structure was owned by Mr. Craighead also. Mr. Craighead was vice president of the Gaar Scott Co. and secretary of the Richmond Water Works. The front part of the home has cherry woodwork and a very elaborate entrance and stairway.